Maybe because the system needs to re-upload it again. Space considerations. I think this thread is more focused on suburban downtowns, but I'll post a few pics. I'm planning on walking around this weekend and snapping a few spring pics. The thing is, this site won't let you post a pic that you've already posted in another thread! Why is that? That's ridiculous. Morristown's downtown is really nice. centered around "the green". during the winter it is lit up really nice with lights and whatnot. it has a fairly urban feel to it, though pretty small. Have many memories around "the square", love Morristown. An interesting couple of pics from Cranford website that shows approximately the same viewpoint of downtown - one from 1912 and the other from 2005. Notice also the police cubicle in the 1912 pic in the middle of the intersection. This was called the "Green Light Hotel" because it was inhabited by a cop. It was removed from there a few decades later because it was too dangerous for the policemen. Great pictures! That clock looks better than the small triangle and car park. I'm glad to see that Cranford trust is still around as is the three story building a few doors down to the right in the picture. Thanks...also, the triangular building in the center, which looks like is gone today, in the 1940s was occupied by the Reel Strong Coal Company. 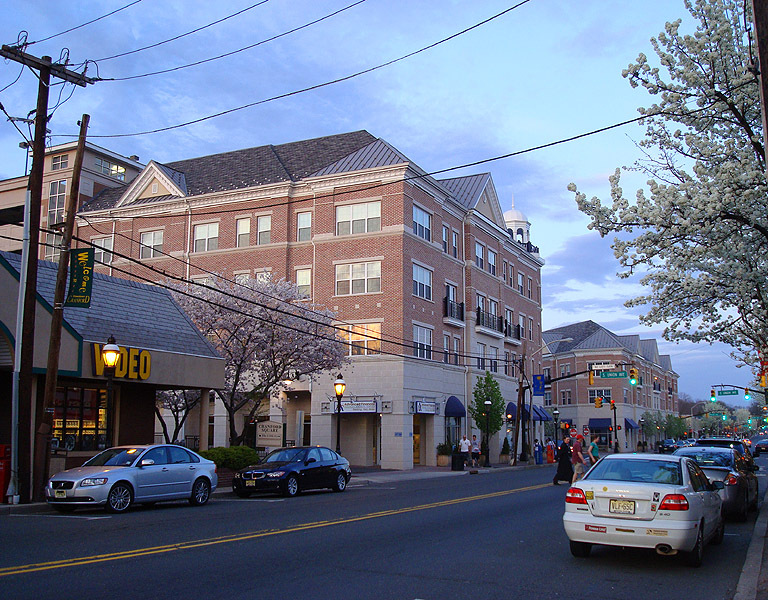 Pedestrians scurry past the two halves of the Cranford Crossing complex, which dominate the southside downtown area of Cranford. A Blockbuster Video store is to the left of the picture. There is a lot of controversy currently dogging this complex, which towers above other structures in the area. It has struggled to fill the vacant store fronts and apartments in this time of national recession. Recently, an artist group petitioned to create a Visual Arts Center along the first floor of one of the buildings. Last edited by kalim2008; 04-18-2009 at 08:50 PM..
Tommy, there is an option that lets you attach an image by giving the URL. If you've already posted the images in another thread, you can just link to them. It's the "insert image" icon (the one that looks like a postcard, between the envelope icon and the "word bubble" icon).